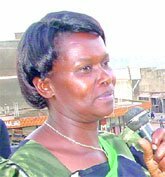 Agnes Mayanja's election to Parliament unopposed was struck down by High Court Judge Richard Oscar Okumu Wengi, in favor of Sauda Namaggwa Mugerwa, a former diplomat. Mrs. Mugerwa completing her first term failed to submit her academic testimonials in time to the Electoral Commission a requirement for parliamentary nomination. The circumstances of this ruling are still being studied.